On January 1 this year, in his televised New Year’s Day speech, Kim Jong-un threatened that “the entire United States is within range of our nuclear weapons, and a nuclear button is always on my desk.” At the same time, however, Kim indicated his openness to dialogue by urging South Korean authorities to “respond positively to our sincere efforts for a détente, instead of inducing the exacerbation of the situation by joining the United States in its reckless moves for a north-targeted nuclear war…” He also mentioned Pyongyang’s intention to take part in the Winter Olympics Games in Pyeongchang, South Korea, in February, which later led to the inter-Korean talks and exchanges before and during the Games. On August 8, 2017, President Donald Trump said, responding to a news report on North Korea’s technological progress toward becoming a full-fledged nuclear power: “North Korea best not make any more threats to the United States… They will be met with fire and fury like the world has never seen.” The expression “fire and fury” obviously indicated a possibility of using military force. Given the great risks involved in a military option on the heavily armed and densely populated Korean Peninsula, a common-sense judgment would favor a diplomatic solution, as long as it is effective in denuclearizing North Korea. In fact, the Trump administration has also repeatedly said a diplomatic solution is its preference. But a military option is not ruled out, as North Korea has not shown any sign of slowing down its nuclear program despite the high level of sanctions imposed for it. Under these circumstances, it is not likely for diplomacy to replace confrontation without Pyongyang’s decision at least to come back to the table, in talks such as the long-dormant Six-Party Talks. There is every reason to believe that if such a turnabout happened, the mood would change dramatically. For one thing, all the key countries would waste no time to welcome it for different reasons. China, the host to the Six-Party Talks, and Russia, a new advocate of dialogue, would of course jump at it, and so would the current government in Seoul that has been clearly inclined to pursue peace with Pyongyang. Trump would also be able to say, without even having to exaggerate, that he succeeded in bringing North Korea back to nuclear negotiations in the second year of his presidency, which President Obama could not do for 8 years. Japan might still show some skepticism but would have no reason not to welcome the resumption of denuclearization talks. Pyongyang’s return to nuclear talks, however, would by no means guarantee a successful outcome. If past experience provides any lessons, negotiations with North Korea have always been tough and time-consuming. Furthermore, we already saw at least two successful agreements breaking down in their implementation process in the past. Therefore, a resumption of the nuclear talks might give a breathing space to the players but might not successfully end the crisis. It might be more like a respite between crises. The Trump administration has been using the term “maximum pressure” as the label for its North Korea policy. How is it different from the “strategic patience” approach widely credited to Obama? Strategic patience, despite the name, was also about applying pressure without engaging North Korea. The Trump administration has also responded to North Korean provocations, including one nuclear test and three ICBM tests last year, by strengthening the sanctions regime, both international and unilateral. Perhaps, the difference might only be revealed when and if the United States engages North Korea, either through dialogue or by force. In any case, for both maximum pressure and strategic patience, the primary tool is sanctions. The UN sanctions regime against North Korea, which has been upgraded through 8 Security Council resolutions over the past 12 years, stands as one of the most robust in history. In addition, the United States, Japan, and South Korea are also applying unilateral sanctions against North Korea. Can “diplomacy” replace these sanctions in dealing with North Korea? That is not likely in the near future. Above all, UN Security Council sanctions are complex and difficult not only to adopt but also to lift. All sanctions resolutions clearly state the reasons for taking those measures, which in North Korea’s case is the development of nuclear weapons and ballistic missiles. Therefore, a lifting or lessening of the sanctions can only come after certain progress is made in the denuclearization of North Korea, if not total disarmament. In other words, diplomacy with North Korea, even if it were to be revived, would have to proceed in parallel with the sanctions for quite a while. When it comes to ensuring the effectiveness of the sanctions, China undoubtedly plays a critically important role. Beijing has been working with the other members of the Security Council in response to North Korea’s nuclear and missile provocations, but only to the extent that measures would not lead to destabilizing the regime in Pyongyang. Since the Cold War years, Beijing has always maintained a geopolitical perception of North Korea as a buffer state. To be sure, a nuclear North Korea is unacceptable to China, both as a guardian of global nuclear non-proliferation and in terms of its strategic interests vis-a-vis America’s growing defense partnership with allies in the region. But losing the buffer due to a collapse of North Korea is also unthinkable, and hence China’s dilemma. After Pyongyang’s announcement on the “completion of its nuclear force,” however, Beijing seems to be moving more decisively in implementing the sanctions against North Korea, which might also be instrumental in pressuring Pyongyang into making the right decision. Then, one might wonder whether or when the current crisis and confrontation on the Korean Peninsula will eventually give way to diplomacy for the reunification of Korea. From the perspective of South Koreans, there are at least three major challenges that need to be addressed before pursuing Korean unification. Those are: 1) the North Korean nuclear issue, 2) the lack of trust between the two Koreas, and 3) the decline of people’s interest in unification. In this commentary, only the first issue is considered. The North Korean nuclear issue, which has been around for over 20 years, might not have been a serious hurdle for unification until 10 years ago. However, under the current comprehensive sanctions regime against North Korea brought over six rounds of its nuclear tests, it is now virtually impossible for any country, let alone South Korea, to pursue meaningful dialogue and cooperation with North Korea. Seoul might be able to continue the recently resumed dialogue with Pyongyang, especially on humanitarian issues such as reunions of separated families. Some humanitarian assistance might also be resumed. But possibilities for more substantial economic cooperation, such as reopening the Kaesong Industrial Complex, have all been blocked by the new UN sanctions put in place in 2017. Even during the preparations for the Pyeongchang Olympic Games, many considered whether flying a South Korean airplane into North Korea was a violation of the sanctions. As such, the current sanctions regime against North Korea does not leave much room for interactions between South and North Korea. This is why the North Korean nuclear issue constitutes the toughest stumbling block, which needs to be removed first for the two Koreas to be able to pursue trust-building measures and strive toward unification. Furthermore, how the nuclear issue will be resolved will have great bearings on when and how the two Koreas can engage in diplomacy for inter-Korean cooperation and integration. If the current crisis ever escalates into an armed clash, it would become extremely difficult to predict what will happen to North Korea, and to a certain extent to South Korea, even if the nuclear issue is brought to an end. That is why for South Korea, the importance of a peaceful solution to the issue cannot be overemphasized. 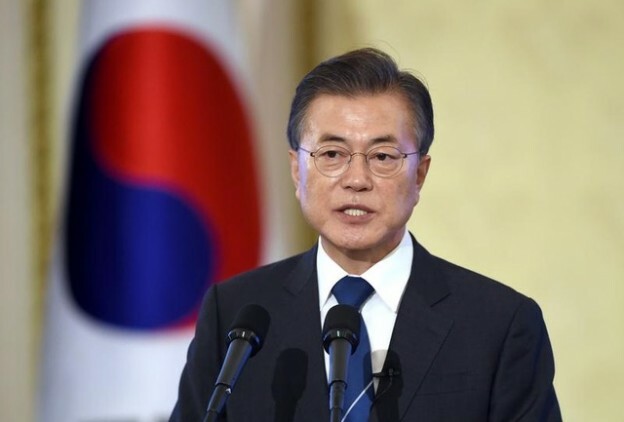 Moon Jae-in, in his speech to the UN General Assembly last September, stressed that South Korea does not seek the collapse of North Korea, nor unification by absorption. What South Korea seeks, he said, is permanent peace on the denuclearized Korean Peninsula, achieved in a peaceful course of action. North Korea is now at a critical crossroads for its future. Having completed nuclear weaponization, as it claims, and trying to turn to economic and social development, the regime will face a moment of truth in due course. If history can offer any indication of what will happen in the future of North Korea, it should be remembered that most dictatorships in the world went down by challenges from the inside, not from the outside. What the Pyongyang regime needs in order to remain in power at this point are not nuclear bombs but food, clothes, cars, and smart phones for its own people. It would be in the interest of the regime itself to seek change, rather than waiting to be changed. By doing so, North Korea can make the right choice and embark on a truly new beginning in inter-Korean relations as well as in its relations with the rest of the world.